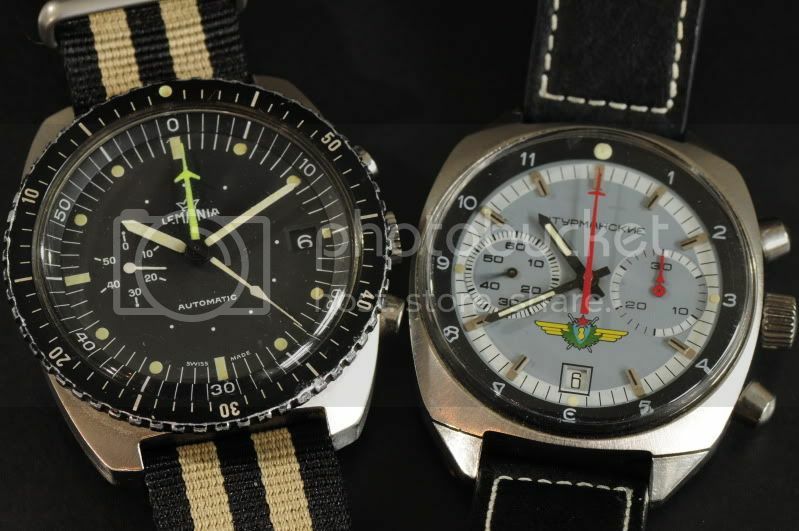 These two watches have a number of parallels: both are from the 1980s, both air force issue, both house robust 21,600 bph chronograph movements, both have date complications, both feel surprisingly heavy with their solid stainless steel cases, and both would have seen action on either side of the Cold War divide. 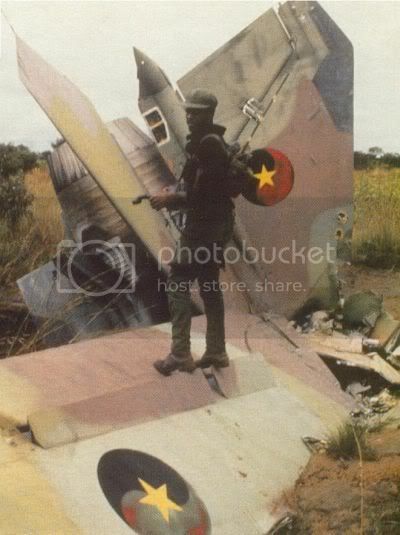 South Africa fought in the 'Border War' that raged in Angola and South West Africa (now Namibia) between 1966 and 1989. The conflict began in South West Africa to rid that country of South Africa's colonial yolk, but soon extended to Angola as South Africa stepped in to assist Portugal, the colonial power there, in their fight to suppress similar Angolan liberation movements. The various South West African and Angolan liberation movements were Marxist in their ideologies, and were increasingly backed, both militarily and financially, by the Eastern Bloc and their allies (primarily Cuba) who saw these developments as an opportunity to gain control of the region's mineral wealth. The USSR's interests were stated openly in 1973 when Soviet President Brezhnev said, "Our aim is to gain control of the two great treasure houses on which the West depends: the energy treasures of the Persian Gulf, and the mineral treasure house of central and southern Africa." By 1989, for example, there were 55,000 Cuban soldiers in Angola, with a total of approximately 350,000 Cubans seeing military service there over the period of the conflict. Over time, several thousand Soviet, East German, Romanian, North Korean, and other Eastern Bloc personnel also provided technical and military support in the region. Although South Africa was banished from the international community over most of this period due to its apartheid policies, it was still seen as pro-Western and it therefore had the silent blessing of most Western governments to fight against the perceived Communist threat in the region. The Border War thus increasingly became a hot extension of the Cold War conflict. In addition to the Border War, South Africa also became operationally involved in the Mozambican Civil War between 1977 and 1990. The aim here was to support the anti-Marxist side in the war, as well as to strike against ANC bases which were being set up in Mozambique. During the 23 years of Bush War combat, the SAAF was transformed from a peace time ‘fledgling' air force into a formidable strike force, taking on the best Soviet air defences of the time including a huge array of modern Soviet aircraft, radars, surface-to-air missiles and anti-aircraft guns. 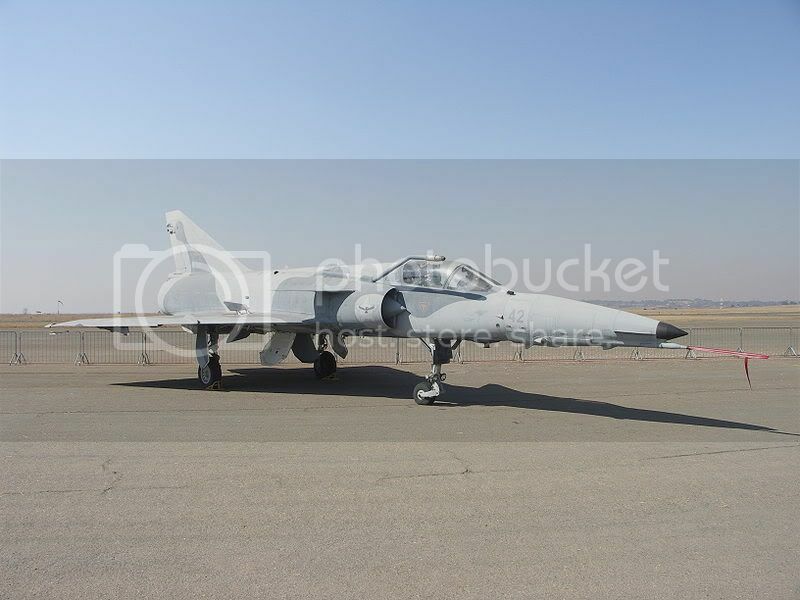 The UN's anti-apartheid driven mandatory arms embargo which was imposed in 1977 prevented South Africa from obtaining replacement military aircraft, so the SAAF had to preserve its existing stock of Mirage III and Mirage F1 fighters and bombers. In the latter part of the conflict, the older Mirage III's were converted to upgraded Cheetahs to counteract the growing threat from the newer Soviet MiG-23s and the increasingly sophisticated Soviet-supplied air defence network. Given the very close working relationship between South Africa and Israel during the 1980s and early 1990s in terms of development of military equipment (including nuclear weapons), there was collaboration between these two countries on their respective Cheetah and Kfir fighter development programmes. 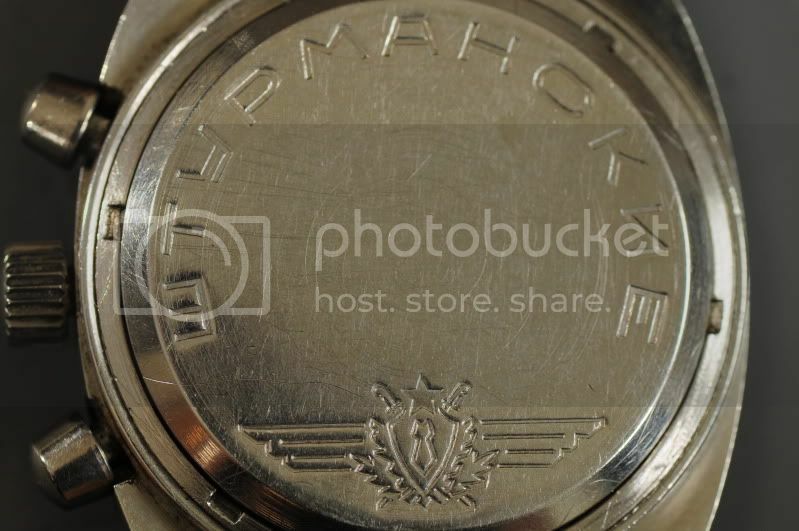 The Lemania 5012 calibre is a Lemania 5100 without the 24-hour subdial. In addition, it runs at a slower beat rate of 21,600bph as opposed to the 5100's 28,800bph. The arrow-headed hand is the chrono seconds counter, while the luminous green sword hand is the minute recorder. Constant seconds sub-dial at 9 o'clock to let you know the motor is running. There's a solid, satisfying feel to the operation of chrono buttons. The 1968 Brezhnev Doctrine officially asserted the Soviet Union's right to violate the sovereignty of any country attempting to replace Marxism-Leninism with capitalism. This captured the tone of the USSR's foreign policy for the next few decades. In addition to various interventions intended to put an end to democratic liberalisation efforts and uprisings in the Soviet satellite states, the USSR became embroiled in the war in Afghanistan between 1979 and 1989, as well as in numerous adventures in third world and other socialist countries around the world to varying degrees. The Военно-воздушные силы ('BBC', meaning Military Air Forces) was the official designation of one of the air forces of the Soviet Union. The other was the Soviet Air Defence Forces. At its peak in the 1980s, the BBC could deploy approximately 10,000 aircraft, and at the beginning of the 1990s the Soviet Union had an air force that in terms of quantity and quality fulfilled superpower standards. 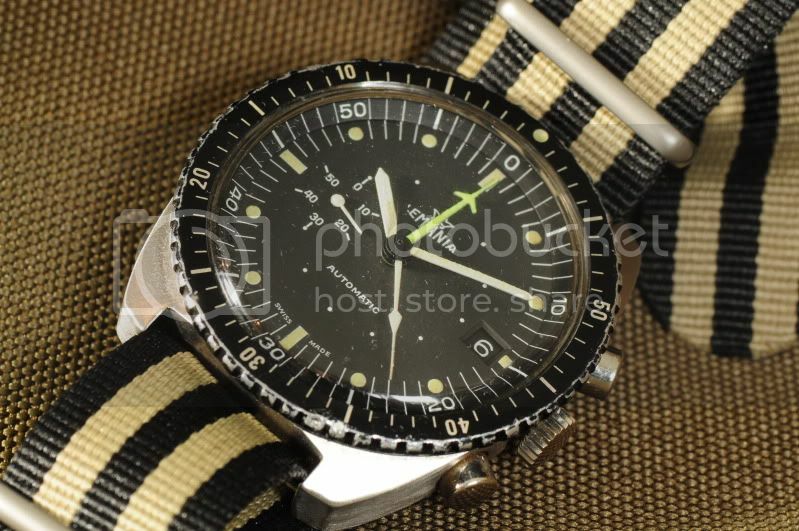 The Soviets introduced a new chronograph caliber in 1976 which was designated the 3133. It was based on the Valjoux 7734, although the Soviets made a number of modifications (for example, the balance wheel was changed and the beat frequency was raised to improve accuracy), but many of the parts remain interchangeable. The new chronograph calibre entered service in 1976 in the Океан (meaning Ocean), and was initially exclusively used by the Soviet Navy. 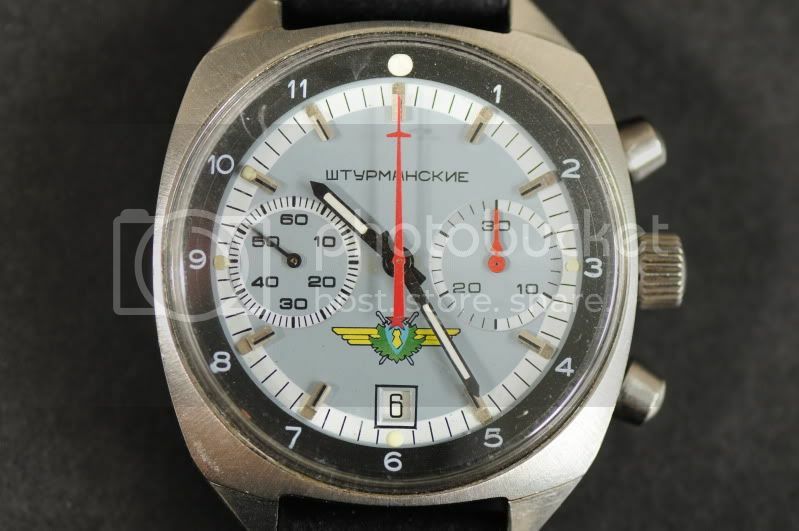 Later, other official versions such as the Soviet Air Force Штурманские / Sturmanskie (meaning Navigator's) were introduced. 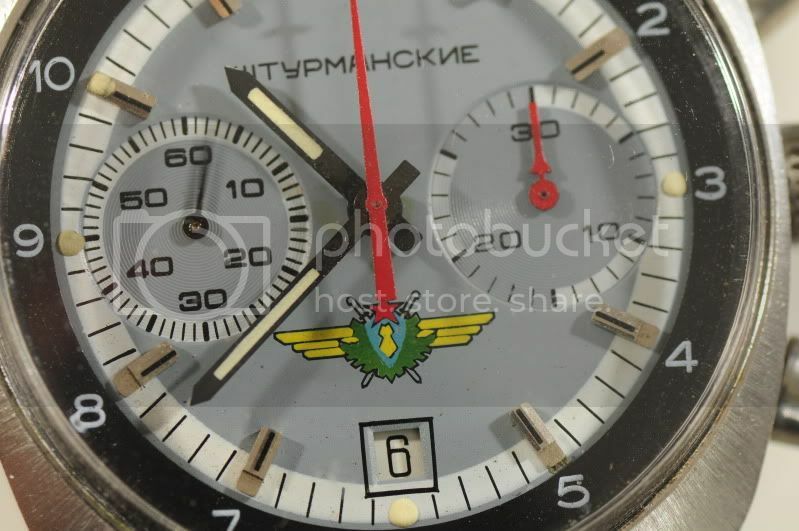 The Sturmanskie I have here was produced in 1987 (the first year that these were produced), and would have been issued to a Soviet air force officer. 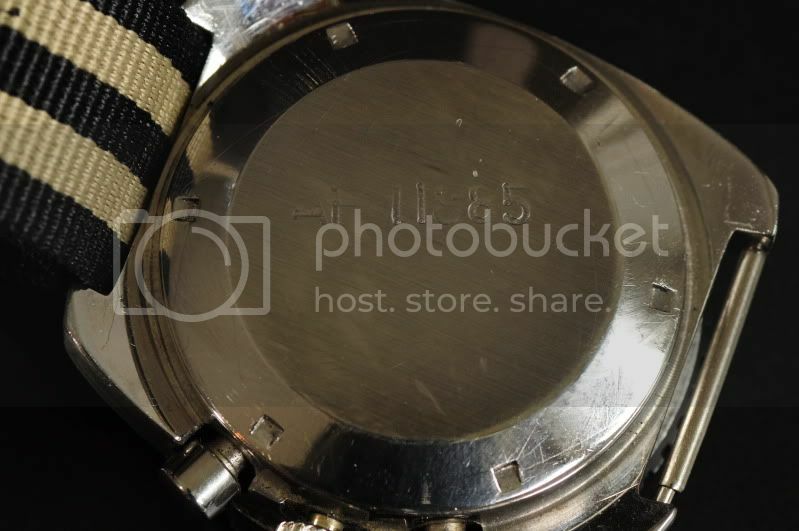 It has a stainless steel case and 31659 calibre movement. The 31659 is a hacking variant of the standard (and non-hacking) 3133, having an additional small lever that applies pressure to the outside of the balance when the crown is pulled out, thereby freezing the balance and hacking the watch. 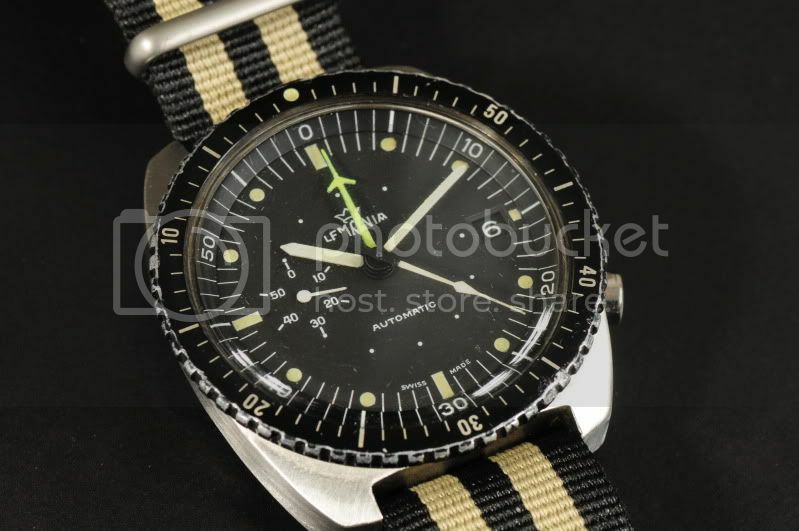 A lower quality civilian version with chromed case and non-hacking 3133 movement was also produced, but it was only the military issue pieces which contained the stainless steel cases and hacking movements. 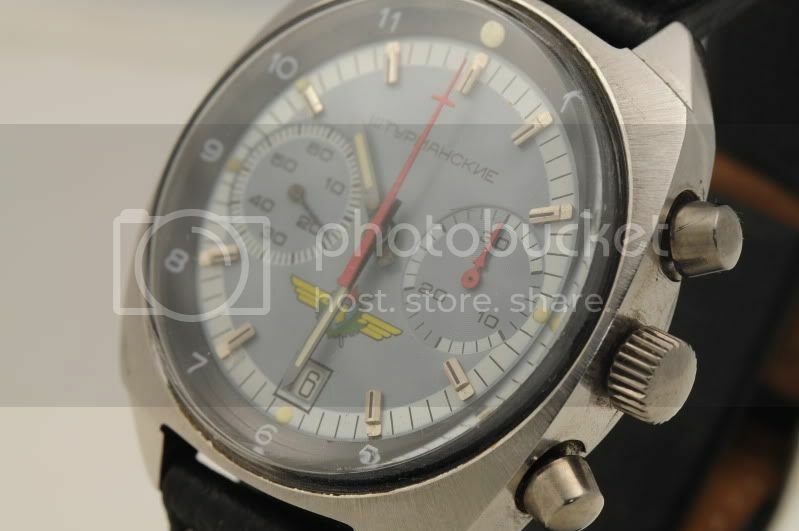 With its austere grey dial, could this watch be anything other than Soviet? Nice thread I like that Lemania. I thought a few things were missing from my collection! Great thread, Brendan. 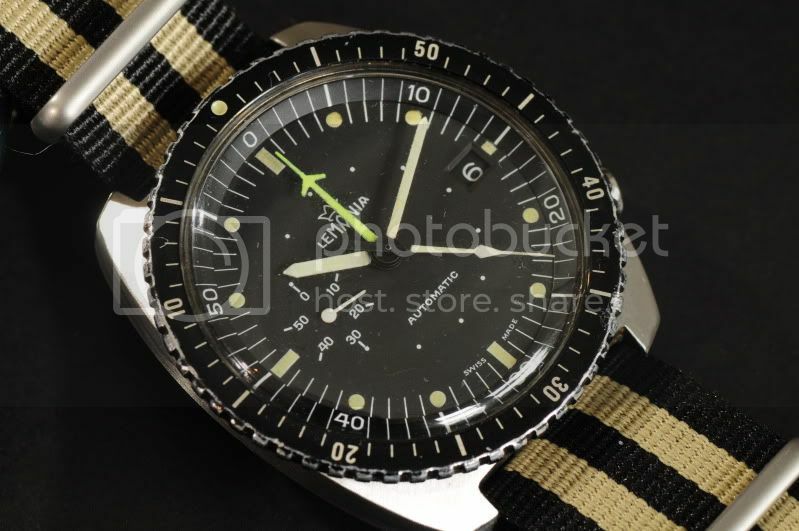 Good to see someone else appreciates Russian military watches. 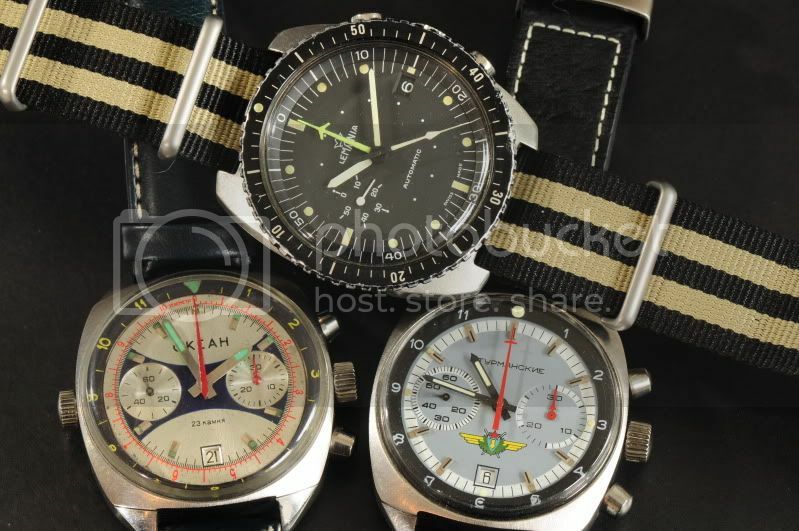 I have always been intrigued by the Soviet solutions to their Western equivalents - watches, aircraft and vehicles. 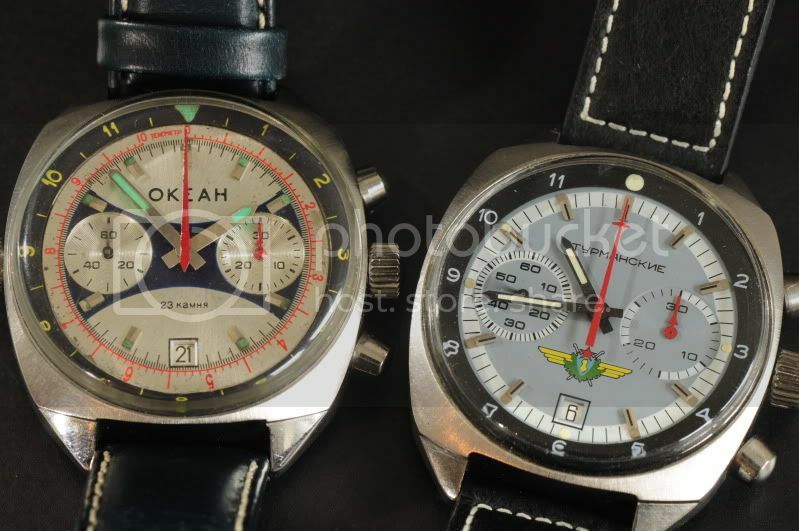 The Okeah and Sturmanskie look like they are good condition - they seem to be hard to find like that nowadays. I see that your 5012 is from the second batch of 400. Did you buy it from Rikus by any chance? Last edited by StampeSV4; 02-11-2010 at 16:14.